Mumbai beggar girl is submitted to ‘My Best Photos of September 2018’ on Nat Geo. Kristian Bertel has contributed to the National Geographic Your Shot community with an assignment called ‘My Best Photos of September 2018’. Curated by David Y. Lee, a producer at Nat Geo Your Shot he wants to see the best of the best. They will be looking for images that tell powerful stories on their own and the special care to giving detailed background in our captions. The images selected for the final story will have wowed us with their composition, and with their compelling captions. Photos that for this Your Shot assignment should be our photos taken during August 2018. As David is saying it: ”- My advice is to follow the light and chase the moments” he says. The Indians on the street are not as easy as the photographer. Escaping poverty seems not only difficult, but impossible. When you live from hand to mouth, your planning horizon does not go beyond the next meal. If you do not know any other life, what do you want to change one can ask. All of us who read this text have won the birth lottery, along with about 1 billion other people. That means we do not have to fight with dogs for food leftovers during our lifetime. The more we say goodbye to the idea that we have earned our own status, the sooner we can feel sorry for the remaining six billion who have been less fortunate. When the photographer first came to India, he suddenly understood the impulse to give up everything at home to help people here. Still, volunteering is not a good idea and the idea of helping with your own hands is nothing more than an ego trip as a result of a White Savior complex. Beggars in India: Giving, helping or donating money? India may even make you an altruist, but you have to decide that for yourself. With your trip, you definitely help the Indian economy, especially as a traveler. Reasons such as longer length of stay, better distribution of money, local consumption instead of import, small business instead of employee. Basically it is better to donate to efficient organizations than to give money to beggars or volunteerism. Despite India’s rapid economic growth in recent years, poverty and begging are still among the biggest issues in India. For a foreign tourist who is not used to seeing so much widespread poverty, it can be confronting and difficult to resist giving money. However, the reality is that it’s likely you are not actually helping. And, this is despite the fact that begging is a crime in most states in India. Why are so many people begging? Are not there any organizations to help them? Sadly, there is more than meets the eye when it comes to begging in India. In general, beggars can be categorized into two types. Those who have no choice and are forced to do it, and those who have mastered the art of begging and make a substantial amount of money from it. While the poverty is real, begging is quite often carried out in organized gangs. For the privilege of begging in a certain territory, each beggar hands over their takings to the gang’s ring leader, who keeps a significant share of it. Beggars have also been known to deliberately maim and disfigure themselves to get more money. In addition, many children are abducted in India and forced into begging. The statistics are alarming. According to the Indian National Human Rights Commission, up to 40,000 children are abducted every year. The whereabouts of more than 10,000 of them remains unknown. 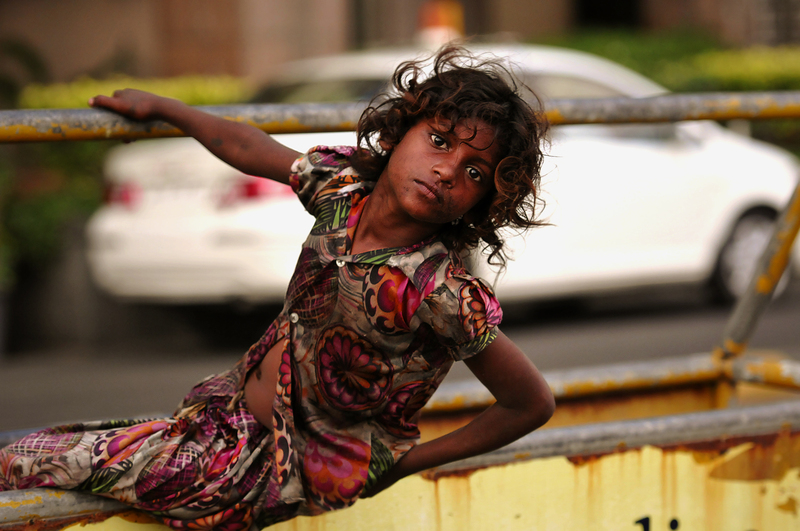 What is more, it is estimated that 300,000 children across India are drugged, beaten and made to beg every day. It is a multi-million dollar industry that is controlled by human trafficking cartels. Police do little to address the problem, because they often assume that the children are with family members or other people who know them. Plus, there are inconsistencies in the law on how to deal with child beggars. Many are too young to be punished. ”- Quite a bit of welfare work in India has been directed at reducing begging, including provided beggars with jobs, with varying degrees of success. The most common problem is that the beggars are so used to begging that they actually prefer not to work. In addition, many of them make more money from begging that what they would if they did work”, the photographer Kristian Bertel says.